The biennial Vermont Flower Show opens Friday at the Champlain Valley Expo in Essex Junction. After what has been a particularly harsh winter for many, organizers expect people looking for a taste of spring may help drive attendance past typical figures of 9,000 for the three-day show. "As soon as people walk into the door, they're going to see spring,” said Melita Bass of Green Works: The Vermont Nursery and Landscape Association. "It just elevates your mood immediately." Bass and her fellow Green Works members have been planning 18 months for the displays, demonstrations, discussions, and vendors appearing this weekend. The focal point, the grand garden display, features bridges, ponds, running water, trees, shrubs, and plants densely tucked into intricately-planned gardens. Mary Jo Childs, one of countless volunteers who help make the event happen, told New England Cable News that a few months of bleak weather left her needing to see plants and bright, natural colors again. "Everybody has cabin fever," Childs said. "I was ready to skip out of town. I was starting to get visions of Florida. But when I realized the flower show set-up was just a couple of weeks away, I knew that would do it for me. I didn't need to go to Florida this year. Everything I needed for my soul I could get here." After the show wraps up Sunday afternoon, many of the plants used to create the large central display are sold at affordable prices, Bass said. 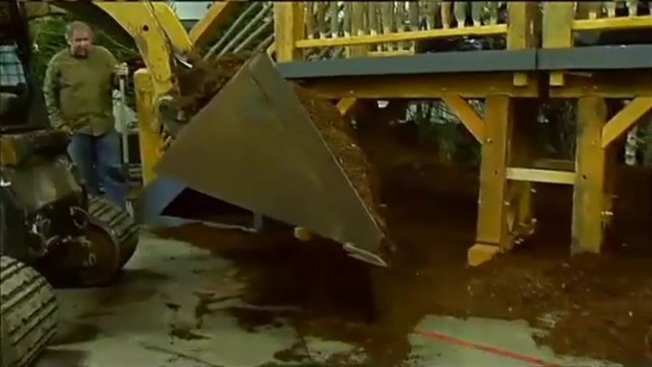 Others are donated to hospitals and nursing homes, and some material that can be hard to reuse, like bark mulch, will be sent away to be composted, she added. For more information on the Vermont Flower Show, visit their website.